At work, I wanted to produce a work that had a multicultural feel, and being that my Mexican roots cry to be exposed every time an opportunities comes around, I decided I wanted to direct a play about Frida Kahlo, the "surrealist" Mexican painter, married to Diego Rivera, the great Mexican muralist. Originally I wanted to direct someone else's play but someone above my supervisor decided that I should write the play, after all, I'm a playwright, right? (Obviously, they don't know much about theatre.) And so, the Frida Kahlo Project was born. From the moment I knew I was going to be the playwright, I started the research. So far, I've read "Frida: A Biography of Frida Kahlo by Hayden Herrera." I watched two documentaries one by PBS titled, "The Life and Times of Frida Kahlo." I revisited the movie "FRIDA" directed y Julie Taymor and acted by Salma Hayek. 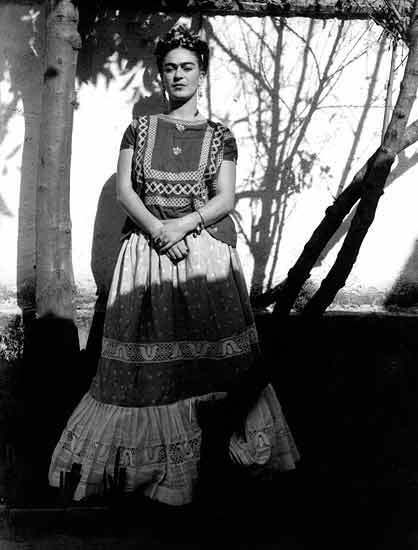 I also read "Frida Intima," by Isolda P. Kahlo, who is Frida's niece and appears in many of the pictures and paintings. Right now I'm in Mexico City getting ready to tackle the visits to four different museums found in four different areas of the city. And no, one cannot visit two museums per day; there is a lot of distance to cover from one place to the next. So, I'm visiting one museum per day with the hopes that I don't overload. You would think that with all this research, I should know what type of play I'm going to write. I don't know. But this I do know: I don't want to write a fictional account of Frida's life based on true events. I don't want to write a play about Frida and Diego; the movie did that and it bored me to death. I also don't want to write a story where everything of emphasis is the fact that Frida suffered, suffered, and suffered some more, which is basically what everyone seems to think when looking at her paintings and reading about her life. It is clear I know what I DON'T WANT TO DO. But I'm still wondering what the hell is it that I WANT TO DO. Whatever it is, I hope it comes out in a way that sheds new light into Frida's personal life and artistic achievements while combining Mexican traditions, music, dance, and culture, specially from the State of Oaxaca. Why? Well, because Frida's roots are there hence the reason why she wore a Tehuana most of her life.